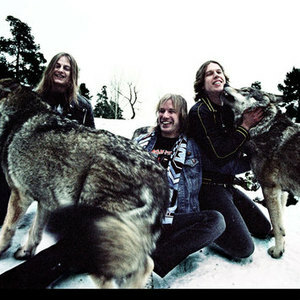 There are multiple artists with this name: 1) Wolf is a heavy metal band from Sweden (active). Current line-up: Niklas "Viper" Olsson ? Lead Guitars & Vocals Anders "Tornado" Modd ? Bass Richard "Raptor" Holmgren ? Drums Simon Johansson ? Guitar 2) Wolf is a heavy/speed metal group from Japan (Currently disbanded). For this specific band, please change your tags to ????. 3) Wolf is a NWOBHM band from Cheshire, UK (disbanded). 2) Wolf is a heavy/speed metal group from Japan (Currently disbanded). For this specific band, please change your tags to ????. 5) Wolf is a black metal outfit from Germany. 6) Wolf is the stagename of a demoscene musician, Maarten van Strien. He predominantly used the handle Wolf_ in his compositions on the MSX home computing platform before adopting the more widely known handle of Crystal Score. Songs on Last.fm have been tagged with crystal score to distinguish them from compositions of other artists named Wolf. 7) Wolf is also an italian singer-songwriter from Pisa. 9) Wolf was a rac project of Ken McLellan & Kai St?we. 11) Wolf is also the nickname of an indie musician from argentina, that plays in lots of bands and solo projects ranging from prog jazz to delta blues and chiptune music.